The social reality of rising sea levels. Buho Buho and Morotai are quite literally sinking into the sea. Old giants of the jungle stoically put up a last stand against the inevitable, some managing to stay alive while part submerged if they are located near a river mouth with a lower level of water salinity, others like the eerie old tree on the beach at Buho Buho are long dead but still standing. Eastern Indonesia is unique in the present global plate configuration, being situated at the T-junction between the world’s two main active orogenic belts – The Alpine-Himalayan and Circus-Pacific belts. Consequently the tectonics of this region must be understood as a zone of interaction between three major plates. 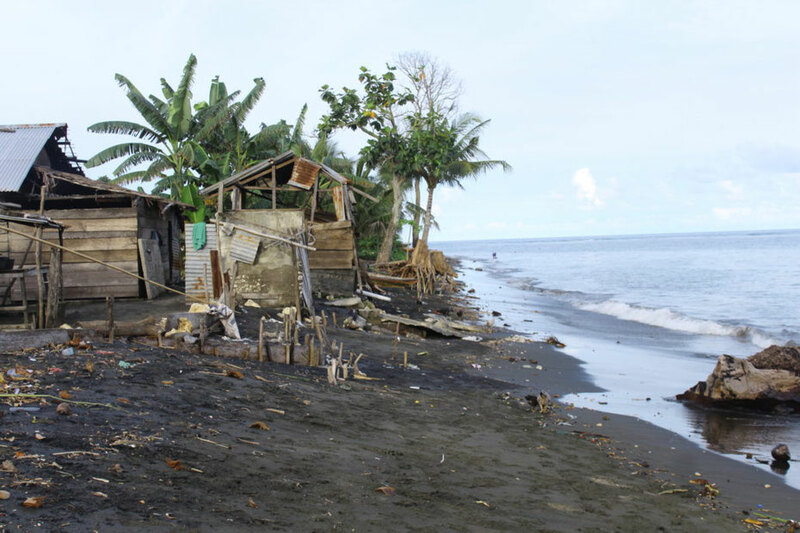 In addition rising sea levels due to climate change are felt most acutely on small islands located along the equator. For Indonesia, an expert has warned that rising sea levels of unto 90 centimetres before 2050 means 2,000 islands and 42 million homes are on track to be submerged. What does this translate to now in terms of locals’ lives and livelihoods? Talking with village elder, Marius (sixty something years old he believes!) we gain an insight into the social implications for everyday life. Marius was born and grew up in his family’s house that (luckily) still stands, now right on the shoreline at high tide! He recounts a childhood spent playing on the “big beach” where he could run some 40 metres from his house to the shoreline at low tide. Today at low tide it is approximately 7 metres. Fishing from the beach was a norm when he was young. There was no need to go out in a boat to deeper water. The catch was always more than enough and it didn’t take long to catch enough to feed the family. Now the opposite is reality. Locals go out in boats to try and catch fish. Often they don’t catch enough to feed their families (and maybe sell a few). It costs more to go fishing, has a greater carbon footprint, takes much longer and yields less. The villagers are currently busy building a rock and concrete wall as a barrier between the encroaching sea and their houses. December to March is surfing season in Eastern Indonesia. This translates to 5 metre waves pounding the beach, causing rapid erosion. If the wall withstands the first big swell of the season it will be remarkable. Barriers in any form, and for any reason, are rarely effective and don’t offer long-term sustainable solutions. Understanding the consequences of climate change to locals’ daily lives and routines is a first step. Looking together at how these realities can be addressed from a social perspective that has environmental benefit and enables a peaceful future, the next. The resilience, innovative-spirit and adaptability of this community gives reason for optimism. They have a history of overcoming challenges and hardships. Drawing on the qualities which have enabled them to do this, we believe new concepts and models developed with these remarkable people will not only prove beneficial for them, but can also be employed in other locations around world to great effect. Contextualising a problem against a different background with a different perspective or approach often throws a before, unseen light on it that can result in exciting outcomes.